I did finish my October UFO, but I posted it yesterday! 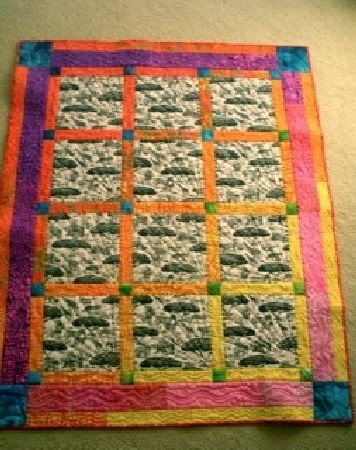 Several UFO finishers have been very productive this month -- Debra finished three quilts in October! UFO #2 - Bonnie Hunter, Love Shack. Bonnie came to San Diego and we had a Love Shack workshop at Paradise Sewing on October 14th. It was a very fun class and we learned a lot - wonky houses, hearts (string-pieced), marverick stars, and letters. The Love Shack workshop cannot be found in any book and is only available by workshop - so if Bonnie is coming your way you may want to have the Love Shack workshop. It is loaded with information and Bonnie, as usual, is an awesome teacher. Debra, I'll be watching for a workshop with Bonnie! 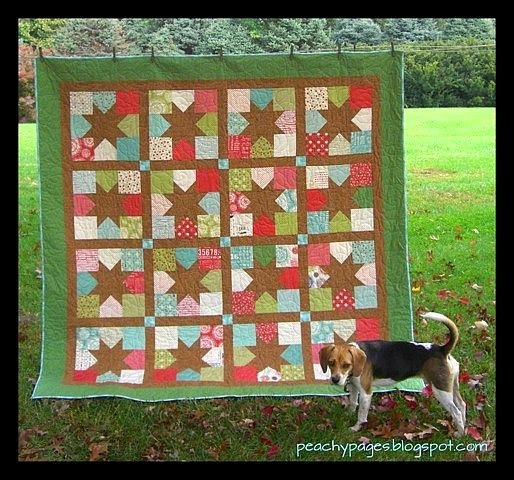 This quilt looks like so much fun! My second picture is the finished Marcus Fabrics Designer Friends and Companions Sew-Along. 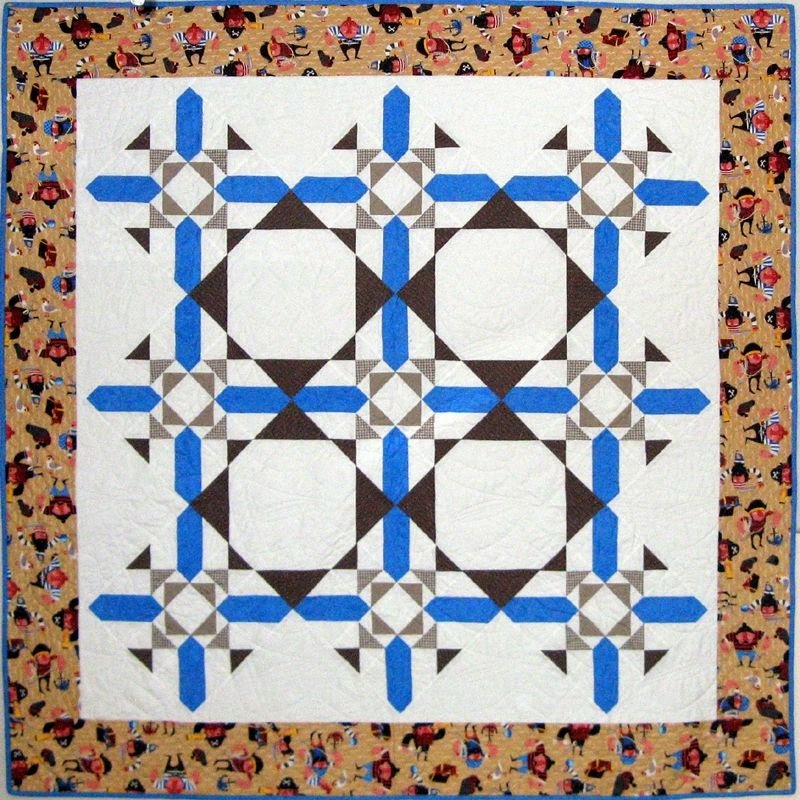 There were 9 instructors who submitted there blocks and the last part was the actual "how to put the quilt together" instruction. This was such a fun sew-along. It was a mystery and blocks were provided on a weekly basis. 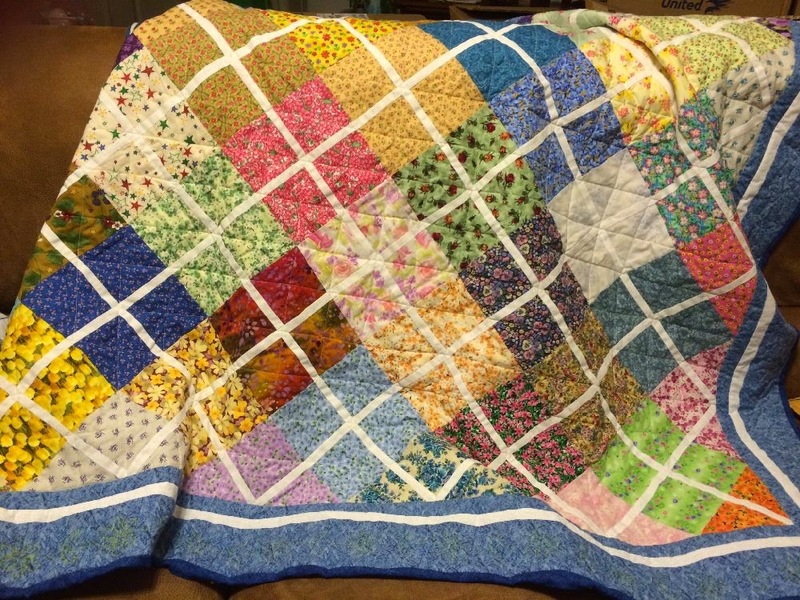 I am not a very good picture taker, but the actual quilt is much prettier - it has reds, blues, greens, cheddars, blacks, and whites. 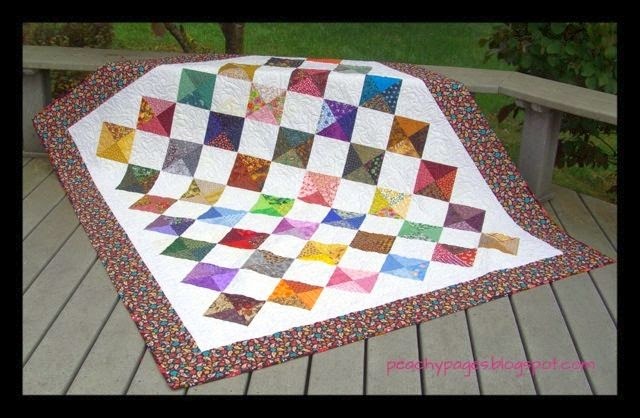 Take a look at Red Crinoline or Heartspun Quilts blogs to obtain the instructions on how to make the quilt. And -- there's another one in my UFO pile! Love your borders, Debra! My last entry is Bonnie Hunters, Scrap Crystals. Bonnie also visited Sunshine Quilter's Guild in El Cajon and had two workshops at Memory Lane Quilt Shop. The first was Winston Ways and the second was Scrap Crystals. I signed up for Scrap Crystals and was so excited from the Tuesday night lecture and getting prepared with my fabrics for the Thursday workshop I think I got myself into a frenzy and couldn't attend because of horrible back pain and a headache. 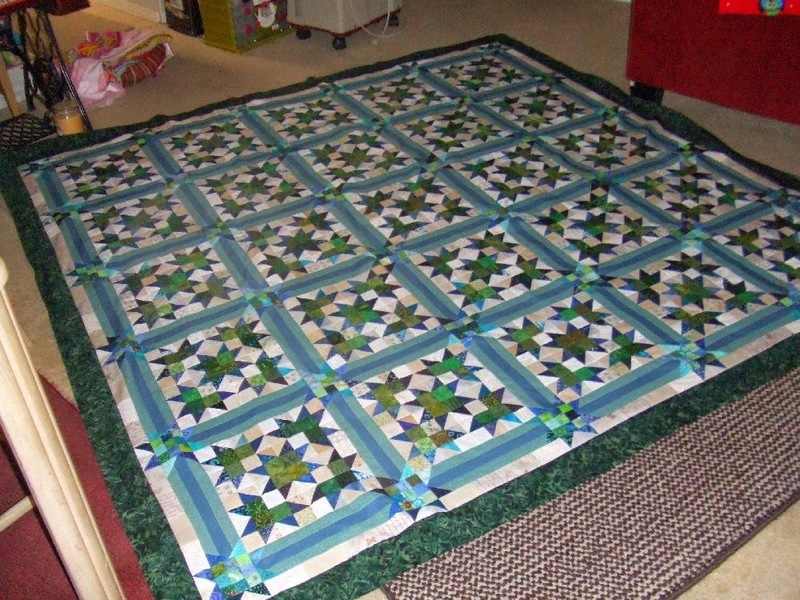 I did complete my Scrap Crystals - I even added another row so the quilt is 5x5 and 88"x88" large. I love it. Debra, I'm so sorry you didn't get to attend the workshop. Your quilt is gorgeous! There is quite a story behind Arianna's quilt, I'll let her tell it. I finally finished a quilt - my first one! In our area, women who have children or are pregnant and who are convicted of crimes must take their children with them to jail if they have no family members to care for the children. Many are taken to jail with little more than the clothes on their backs. As a result, our church runs a ministry that collects blankets, clothes, etc. for a local women's prison. 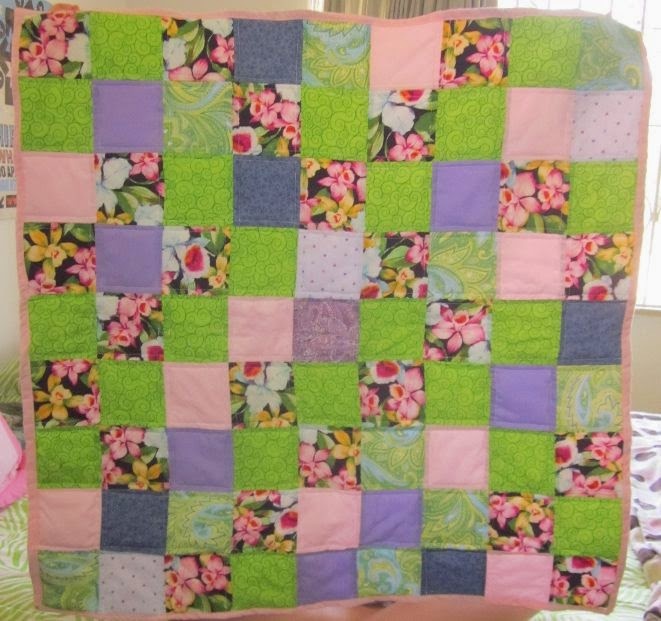 This baby quilt will be going to them. Arianna, I will be sending some fabric to you. I'll try to keep it to a large envelope-size package. 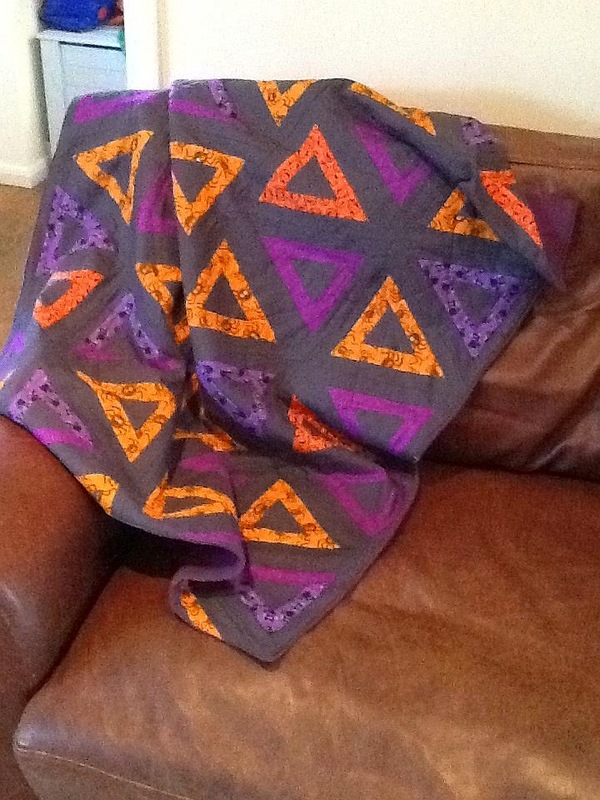 Reyna also sent a photo of a charity quilt. It's called "Sunrise, Sunset," and you can read the details on her blog Yarn In, Yarn Out. It's a great story, you should go to Reyna's blog and read it! 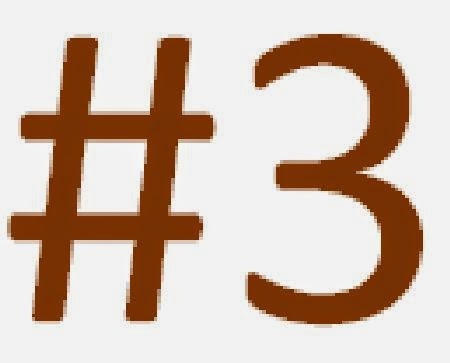 Sandi swapped out the number of her finish for this month. Here is "Kaptain Khorous." Details on Sandi's blog, KwiltnKats, plus a sneak peak at her next finish. Can't wait to see it, Sandi, it looks intriguing! Heather also sent in photos of two finishes for this month. First up is a jewel-toned beauty, "Happily Ever After." Her second finish is her "Leaders and Enders" project, "Charming Stars." Go to Heather's blog, Peachy Pages, for details on these two lovelies. 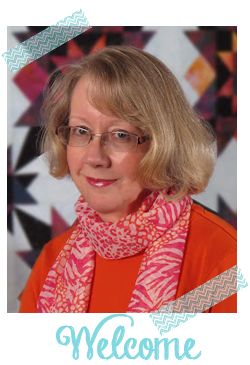 Hey, Heather, is that a new quilt on your blog header? I love it! I am absolutely in Love with Gill's October finish. This Halloween throw is perfect for snuggling under between answering the doorbell for trick-or-treaters! Irene finished an oldie-but-goodie for her October UFO. She says she's had this quilt "in the works" for about five years. I don't see this one on Irene's blog, A Serendipitous Retirement, just yet -- but you'll want to follow her to get the whole story! Ten finishes for October. That's pretty good! Arianna is our first-time finisher this month, so I think she should win the giveaway prize. Arianna, I'll be emailing you to ask for your postal address. Thanks for playing along with "12 in 2014 Finishes!" 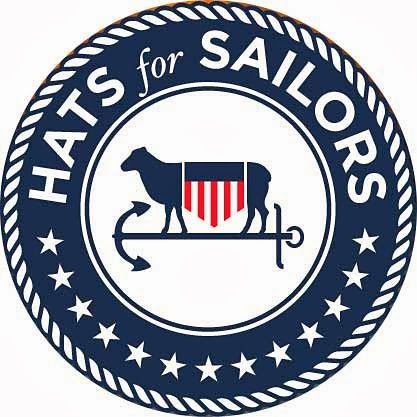 Between traveling with My Little Sailor and a quick trip to Idaho for emergency leave, October was an overwhelming month. I worry that I might have missed someone's UFO Finish email. If I did, please let me know so I can update this post! Great projects each and every one! 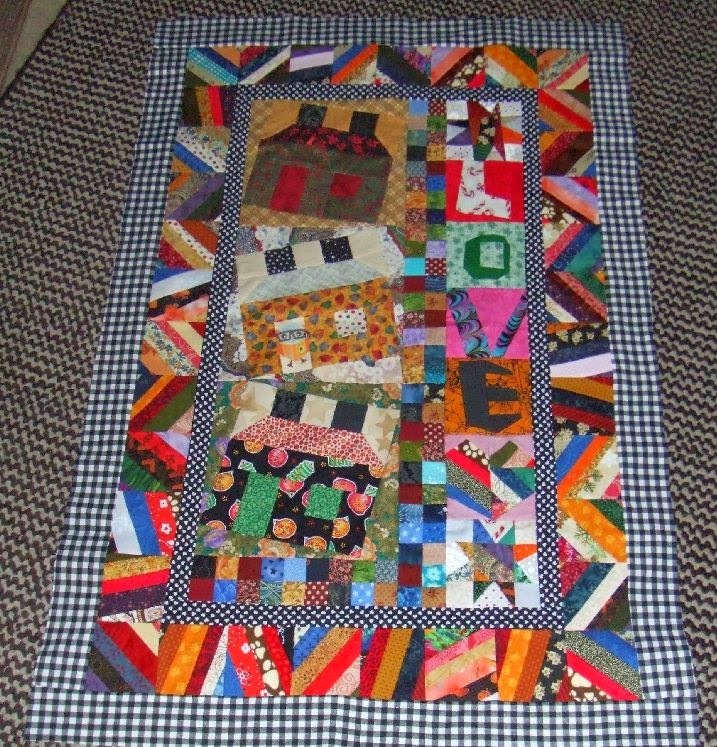 The Americana quilt in my blog header is a quilt I made about 10 years ago. 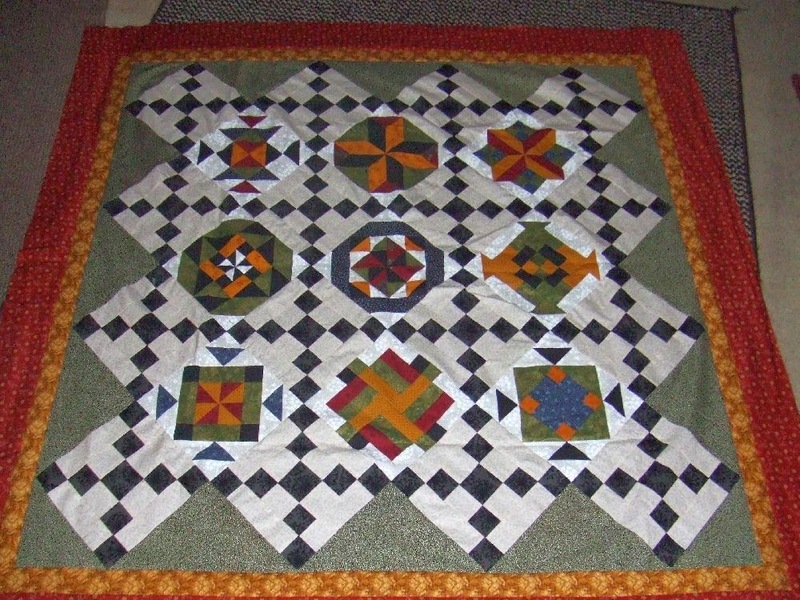 The pattern was Stars & Hourglass from the Nickel Quilts book. It's just one of my favorites and I needed a little patriotism while we were living in Japan! I love it -- and I understand tearing up when you see the Grand Old Flag when you're overseas! Well done to you all, no finish for me this month but well done to everyone, legends all of you!